Last week, when I left off, I mentioned that in December of 1980, I received God’s call into full-time ministry. In the early 80’s, in our denomination, there really weren’t full-time music or worship pastors. Most churches were just starting to look at multiple staff. Usually that first staff pastor was a youth pastor. It was during those years that our church hired it’s first staff pastor and true to form it was a youth pastor. So, my journey began, having no idea how that full-time call would ever work out. My gut instinct was that I would be involved in full-time music ministry. My senior year of high school and the college-aged years were spent pursuing what I thought would be a musical career. Over the next few years, I would be involved in various musical groups. Yes, I still sang with my family. Like I said last time, I was recently listening to some of these recordings and they wern’t too bad. What was interesting was that we had the chance to sing in churches that were liturgical or “high church” in nature or what you would call mainline denominations. They were very receptive of our music and the gospel message that our family presented. We sang in various churches of family as well and would get together to jam. I even remember singing at some family reunions, when we would sing both gospel and country songs. As I write, I remember other things from my childhood. My mom and dad had various musical friends and they would come over to our house, or we would go to theirs and we would have jam sessions. Music was always part of my life. In addition to all of this, I also was very involved in our church’s music ministry. 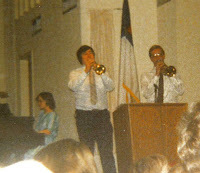 I sang in the choir each week, played bass or trumpet when needed, and helped with the youth group. I think is was during this time that I taught myself guitar, sometimes electric — sometimes acoustic. Musically, I was listening primarily to Contemporary Christian Music and my tastes were quite diverse. One non-Christian album that came out really got my attention. I was listening to a syndicated late-night radio program out of Nashville, called the Larry Black Show. He introduced this particular song by reading the lyrics and then he played it. It was like nothing I had heard before. The song was “Crossfire” by Kansas and immediately became a favorite. The Vinyl Confessions album was selected as one of the top albums of the year by CCM Magazine. I enjoyed listening to this classically influenced rock. Livgren continued his career and I still enjoy listening to his prog rock styled music. I was also pursuing a regular career to support my musical career. I went to college to learn how to program computers. They called it data processing at the time. After college, I went to work, still with the idea of moving toward full-time music ministry. Where was all of this going? Where was God leading me? What was next? There were several influencing factors, which we’ll look at next week.